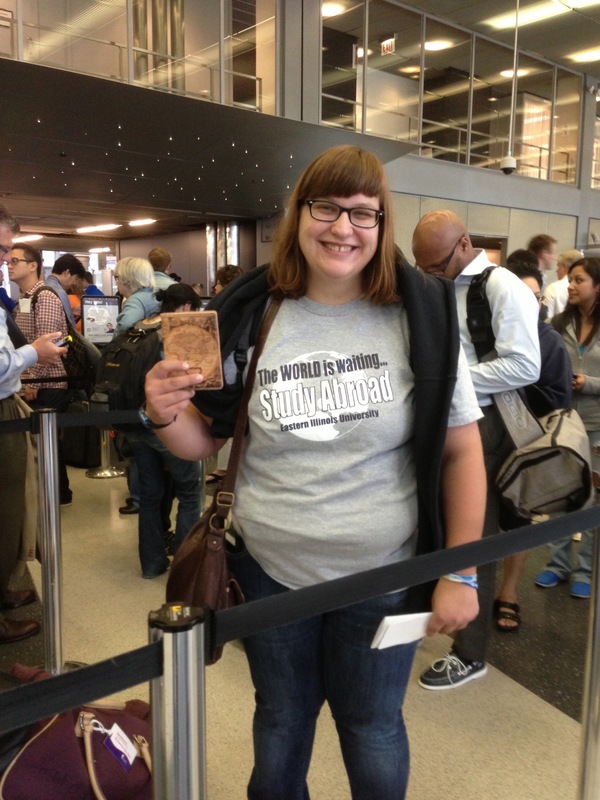 Jocelyn @ the O’Hare airport .. rocking our shirt! Jocelyn Swanson is a junior Foreign Language Major concentrating in Spanish, with a Music Minor at EIU. 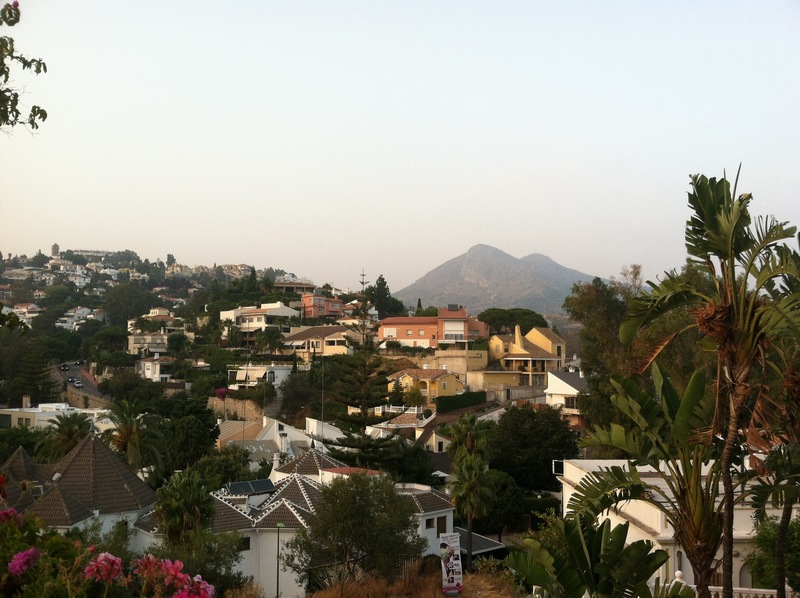 She has just kicked off her fall semester at Malaca Instituto in Malaga, Spain. The Wizard of Oz is one of my favorite movies, and in my experience of leaving the United States and entering Spain, I felt the same as Dorothy. 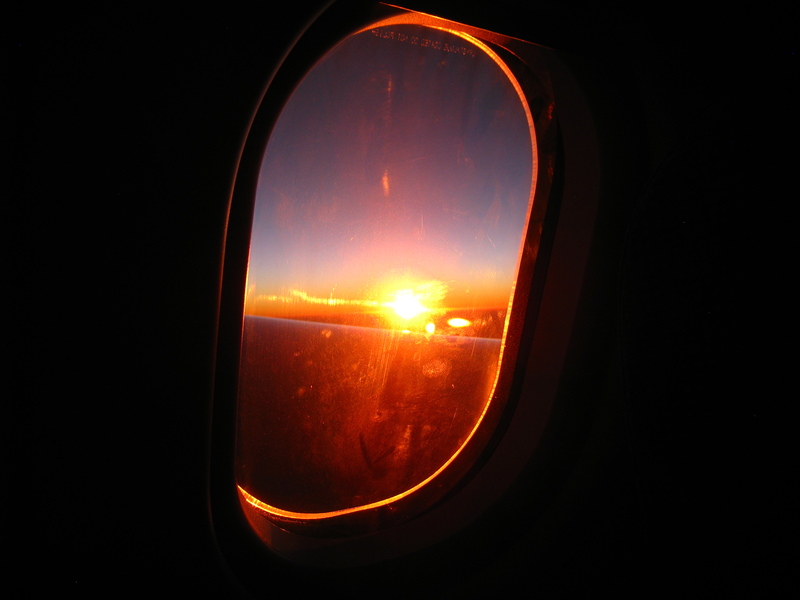 This was my first time leaving the country and I had only flown once round trip, so I had no idea what to expect. Saying goodbye to my parents was hard, and I didn’t know what to do going through security, so I asked random strangers questions. I was lucky and met people along the way who answered my questions, and I met someone who helped me navigate the Madrid Airport, which was a relief! To be honest, I expected that customs would be a lot more difficult, but all I had to do was hand over my passport and boarding pass. They looked at it and then stamped it. I had documentation and multiple copies, but didn’t have to use it. 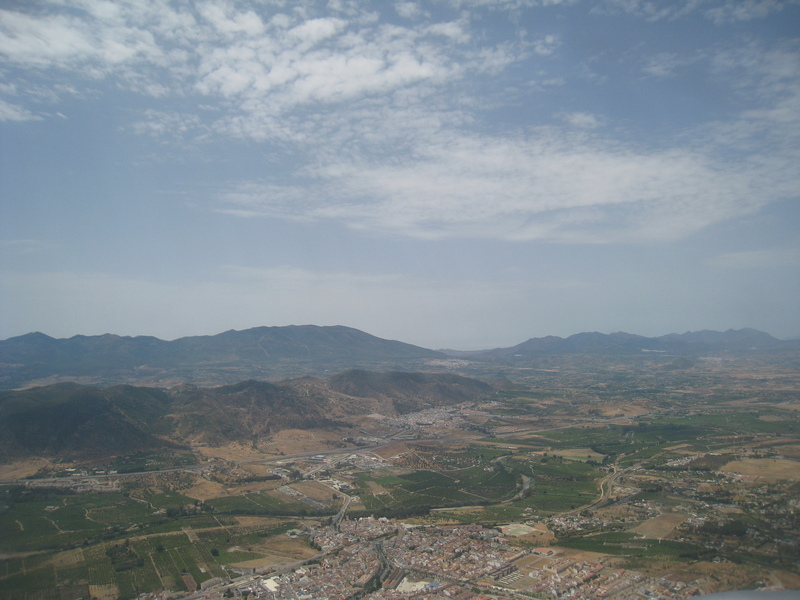 The challenges started when I arrived in Málaga. Going to three different carousels to find my luggage, not understanding the people, and trying to find a payphone to call my mom was exhausting. My first experience of the city was getting lost in 80 degree weather wearing jeans, a hoodie, and hauling around a 40lb suitcase and 25lb backpack, but I managed to get to where I needed to go. I took a bus from the airport and got off a stop too early. Luckily my experiences since then have been better! I felt really insecure about my speaking skills at the beginning. I hadn’t spoken Spanish for about 3 months since coming home for the summer. Trying to navigate was overwhelming—I felt like I didn’t belong and couldn’t communicate. But a couple days with my host family helped immensely, and my skills have picked up so much since. It’s truly amazing how studying a language in its native country helps to learn it! One of the most annoying things was that the banks are only open from 8:30-2:45ish. I had brought cash to exchange but I slept 17 hours my first night here, waking up at 4pm. I could only sleep one hour on the plane. Because I was busy, it took me 6 days to finally get to the bank while it was open. I have to admit that I am still adjusting to the food—I’ve had some appetite issues and have been trying to stick to familiar food. I have visited the same Italian restaurant 4 times since being here, though. I’m a sucker for pizza! Being in Spain hasn’t gone exactly as I’ve expected, but one thing is for sure: I am falling more in love with the language than I thought possible! Everyone was dressed up in different costumes. I saw a cat, even a tomato. The air was filled with excitement. After all, it was Carnaval del Toro! We meandered through the streets, admiring the festivities and costumes, and eventually saw the fences in the distance. We headed in that direction and found a spot on the fence. The bulls would be running by any minute! The Carnaval del Toro run isn’t nearly as large as the famous running of the bulls in Pamplona each summer, but it was exhilarating none-the-less. Before we knew it, the bells were ringing to announce that bulls were in the streets. Five of my friends were standing in the road across the fence from us, ready to face the beasts. As the bulls got closer, the bells started ringing louder and faster. It wasn’t long until we could see the herd and even hear their footsteps. My friends’ eyes were full of terror. In a flash they took off running with hearts beating out of their chests. In a matter of seconds, both my friends and the bulls were gone. Once the running was over we walked down the street to meet up with the rest of our group. Luckily, everyone made it and none of the bulls got out of control. Overall the Carnaval del Toro in Ciudad Rodrigo, Spain was a wonderful cultural experience. Hands down, it was a great way to kick off the ending of my college career since I’ll be graduating in May! Elisha Alto is a senior Spanish major studying abroad at the Universidad de Salamanca in Salamanca, Spain this spring. 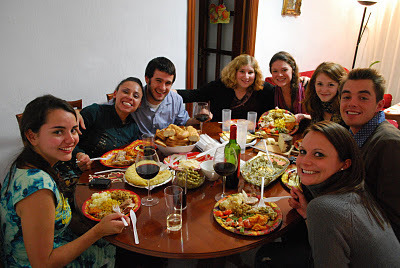 Our coordinator, Kelly, shares a memory of a particularly festive Thanksgiving celebrated abroad in Seville, Spain. This time two years ago, I had a naked turkey between my feet on the ride home from school. It was in a plastic bag, but that was all that was shielding Turkey Tom from the elements and my sneakers. It was so heavy. I had wheeled and dealed with the secretary at our school in Bollullos, who promised he could secure a turkey for me in time for our Thanksgiving feast (difficult to do in Spain). Our conversation was like something from Abbott & Costello. – You want it cleaned? – Yes, please clean it. – Yes, yes .. everything out. – But you want the whole bird? – Yes, the whole thing … empty. – You want to kill it yourself? There was a package from home, bearing the perfect late November gifts my roommates & I had been craving: McCormick gravy mix, cranberry sauce, Stove Top stuffing. We struck a deal with our group of teachers, and agreed to potluck the side dishes that make the meal. Some comedy ensued when we found ourselves without specific ingredients. Namely, pastel-colored marshmallows instead of basic white, on top of the sweet potatoes. In the end our table seats fifteen, mostly Americans, with a Spanish couple in the mix. The end result was beautiful. A heavily laden table, a room full of happy, hungry friends and Spanish wine from our guests. We said our own form of grace, introducing our Spanish friends to the simple tradition of saying what you’re thankful for. Me? I was just glad I didn’t have to kill that turkey myself!